As California enjoys a heat wave with summer like temps, millions on the East Coast are preparing for what could be the worst March storm on record. Named "Winter Storm Stella," meteorologists are describing it as a system that may undergo bombogenesis, which is a term used to describe a powerful winter storm system that intensifies rapidly as it moves towards the ocean. The storm has already left two people dead as it crossed the Midwest and it’s expected to be much more severe when it strikes the East Coast by Monday evening and carries through Tuesday. A blizzard warning is now in effect for much of the Northeast from Philadelphia to Portland and Maine, including New York City. The effected regions are expecting heavy snow, high winds, white-out conditions, power outages and possible flooding along the Jersey Shore. 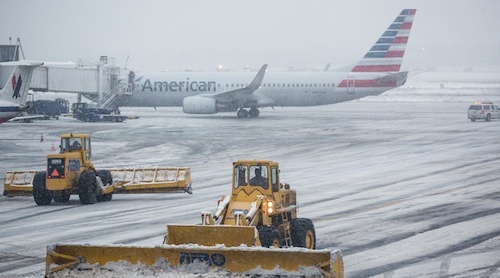 New York and Philadelphia have already declared a state of emergency and thousands of flights scheduled for Tuesday have already been grounded. New Jersey, Gov. Chris Christie said that public and private snow removal trucks are preparing for Tuesday and that the state's salt supply is already at 75 percent of its capacity because of the mild winter. The Connecticut State Department of Transportation says it will have 634 trucks on the road along with 250 contractor plows ready to assist where needed. "This is going to be a lot of snow very quickly. Unless it’s an emergency situation, people should stay off the road Tuesday. You’re not going to see 3 feet in front of your vehicle; you won’t see the shoulder or the snowplow. There will be 50 mph winds and very low visibility. 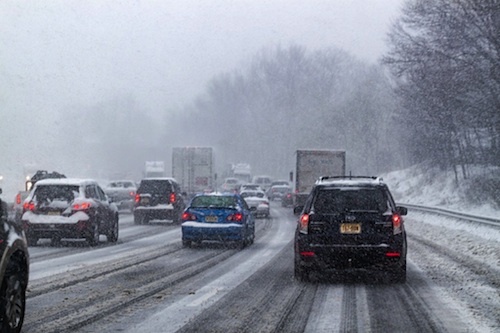 This storm is no joke,” said Connecticut DOT spokesman Kevin Nursick. But despite the warnings, some truck drivers are still planning to do their best to beat the storm in order to do their job. Some got on the road a day early, while others are just preparing for the worst and stocking up on fuel and supplies. "I'm topping the truck off with fuel, we're going to try to get as much out today as we could possibly get out because the next two days are supposed to be pretty bad," said truck driver, Kevin Howe. "I'm driving up to Fredonia, actually right through it so pretty much I just have a bunch of stuff in case I get stuck and just praying that I make it," added truck driver, Collin Gillen. AAA reminds all drivers to stay fueled up as much as possible. A full tank of gas helps to keep the fuel line from freezing and will also allow you to keep running the heat in case you get stranded.